In 2017, Romania had a high rate of economic growth, i.e. 6.9% – one of the highest growth rates across EU28, due to consumption demand boosted by pro-cyclical fiscal measures having as aim to increase the population’s revenues and cut indirect taxation. We estimate that the cyclical going up of Romania’s economy in the last years will continue this year too, as well as in 2019, years when the GDP development could stand at about over 6.1% in 2018 and 5.7 in 2019. GDP/capita in current prices reached 28% of the European Union average in 2016 compared to 26.4% in 2008, while the standard purchasing power GDP/capita stood at 63% in 2017 against 49% in 2008 against the same average. During 2017, we witnessed the going up of the structural budget deficit and of the trade deficit, while the inflation rate moved fast to the upper part of the target. According to NIS, the average rate of consumption prices in the last 12 months (September 2017– August 2018) against the previous 12 months (September 2016 – August 2017) – computed based on CPI – stood at 4.2%. The level of the unemployment rate has continued its downward trend, contemplating the fact that the unemployment rate stood at the end of 2017 close to historical lows, i.e. 3.9%, respectively 4.6%, ILO unemployment (data series adjusted seasonally). But, Romania has been confronted with a certain level of vulnerability on the labour market, brought about by the demographic issue, taking into account the fact that emigration has reached a worrying level of 15% from the country’s population, respectively 25% of the active population. Romania had declared its intention to maintain the budget deficit close to the limit of 3% of the GDP by 2019. Romania’s fiscal standing is sustainable, considering that the budget deficit was 2.9% of GDP, and that the country’s public debt was 60% of GDP. 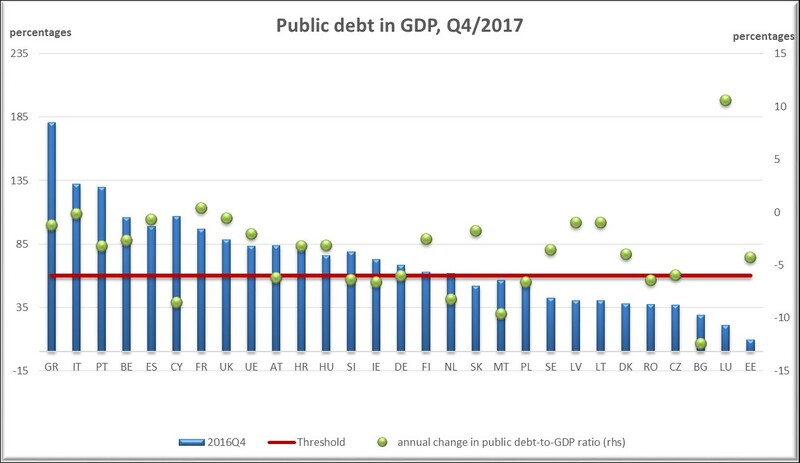 With 35% of GDP, the level of public debt is one of the lowest in the EU in 2017, and is estimated to stabilise at below 40% in the medium term. During January – December 2017, the current account of the balance of payments had a deficit of €6.464 billion, according to the NBR data. The outlook for 2018 pertains to the soundness of the banking sector across Europe and investors’ trust in the development of emerging states in the context of uncertainties related to growth at global level. As regards the vulnerabilities induced by external decisions, we have to take into account Brexit. The interest rates’ development, the advance of new loans by two digits, a better CRM are, next to the challenges induced by external developments, the main concerns of the banking sector for 2018.